We are delighted to announce that Quirke Dental Surgeons has been named as finalist in 2 categories at the Irish Beauty Industry awards 2018 to take place in Dublin in December. We have been shortlisted for Best Dental Practice South and Best Overall Dental Team. We are very pleased to have been recognised for the high levels of service we provide. Well done team!! Snoring – not my problem? Sleep Apnoea is a sleep breathing disorder that is characterised by repetitive pauses in breathing during sleep. Pauses occur several times per hour and last for over 10 seconds. As the blood-oxygen levels decrease, the brain awakens the individual which often leads to a loud gasp or snort. Sleep apnoea is associated with snoring, witnessed pauses in breathing, and excessive daytime sleepiness. Sleep apnoea is usually a chronic condition with most people having sleep apnoea for years before being diagnosed. When breathing appears to stop or becomes shallow, the sleeper comes out of a deep sleep and moves to a light sleep or awakens. This results in poor quality sleep, resulting in excessive daytime sleepiness. There’s a greater risk of having a driving incident, or work-related accident. There are several treatment options for sleep apnoea. One of the options is the oral appliance. Currently, there are approximately 200 different oral appliances available worldwide. We concentrate on using 3 of these appliances to give an effective range of treatments at a level of cost to suit most patients. Also called Mandibular Advancement Devices (MAD), these sleep apnoea mouth pieces are custom made by us to conform to the specific shape of the patient’s teeth and mouth. Not only do they work against sleep apnoea, they are also effective in treating snoring. If you, or your partner, suffer from apnoea or snoring, give us a call on 051 421453 to arrange a consultation about your treatment options. There are two types of dentures – complete and partial dentures. Complete dentures are used when all of the teeth are missing, while partial dentures are used when some natural teeth remain. A Partial denture not only fills in the spaces created by missing teeth, it prevents other teeth from shifting. A Complete denture may be either “conventional” or “immediate.” A conventional type is made after the teeth have been removed and the gum tissue has healed, usually taking 8 to 12 weeks. During this time the patient will go without teeth. Immediate dentures are made in advance and immediately placed after the teeth are removed, thus preventing the patient from having to be without teeth during the healing process. Once the tissues shrink and heal, adjustments will have to be made or the denture may need to be replaced entirely. Dentures are very durable appliances and may last many years, but may have to be remade, repaired, or readjusted due to normal wear. They are however, probably the worst option for replacing missing teeth as they are bulky, are difficult to adapt to, have potential inherent stability problems and can interfere with speech initially. The process of getting dentures requires several appointments, usually over several weeks. Highly accurate impressions (moulds) and measurements are taken and used to create your custom denture. Several “try-in” appointments may be necessary to ensure proper shape, color, and fit. At the final appointment, your dentist will precisely adjust and place the completed denture, ensuring as natural and comfortable a fit as possible. It is normal to experience increased saliva flow, some soreness, and possible speech and chewing difficulty, however this will likely subside as your muscles and tissues get used to the new dentures. You will be given care instructions for your new dentures. Proper cleaning of your new dental appliance, good oral hygiene, and regular dental visits will aid in the life of your new dentures and is crucial in maintaining your oral health. Periodontal disease (also known as periodontitis and gum disease) is a progressive condition and the leading cause of tooth loss amongst adults in the developed world. Periodontal disease occurs when the toxins found in plaque begin to irritate or inflame the gingiva (gum tissue). The resulting bacterial infection, often known as gingivitis, will eventually lead to the destruction of the gum tissue and underlying bone. If periodontal disease is not treated, it can also lead to loose teeth or tooth loss. It is extremely important to note that periodontal disease can progress without any signs or symptoms such as pain. This is why regular dental health checks are exceptionally important so that disease can be identified at as early a stage as possible. Described below are some of the most common signs and symptoms of periodontitis. Cracked and fractured teeth are common dental problems. As people retain their natural teeth longer (due to advances in dental technology), the likelihood of cracked teeth increases. There are many reasons why teeth may crack, for example, biting on hard objects, trauma, grinding and clenching of teeth. All of these behaviours place the teeth under extra strain and render them more susceptible to cracking. When tooth enamel is cracked, pain can become momentarily debilitating. When no pressure is exerted on the crack there may be no discomfort. However, as the cracked tooth performs a biting action, the crack widens. The pulp and inner workings of the tooth then become exposed, and painful irritation occurs. As pressure is released again, the two parts of the crack close back together, and pain subsides. If left untreated, the pulp becomes irreversibly damaged and constantly painful. The resulting pulp infection can affect the bone and soft tissue surrounding the tooth. Other risks of non-treatment include extension of the crack resulting in eventual fracture of the tooth. The future prognosis of a fractured tooth is determined by the extent and location of the fracture. There are many ways in which a tooth can be cracked. The specific type of crack will determine what type of treatment is viable. In many cases, if the crack is not too deep, root canal therapy and a crown can be performed and the natural tooth can remain in the mouth. In other situations, the tooth is too badly damaged and requires extraction. Oblique supra-gingival cracks – These cracks only affect the crown of the tooth and do not extend below the gum line. Usually, the affected part of the tooth will eventually break off. Little pain will result, because the tooth pulp (that contains the nerves and vessels) will usually remain unaffected. Oblique sub-gingival cracks – These cracks extend beyond the gum line, and often beyond where the jawbone begins. When a piece breaks off, it will usually remain attached until the dentist removes it. Oblique subgingival cracks are painful and may require a combination of periodontal surgery (to expose the crown), and endodontic treatment to place a crown or other restorative device. Vertical furcation cracks – These cracks occur when the roots of the tooth separate. This type of crack almost always affects the nerve of the tooth. Because the tooth will not generally separate completely, root canal therapy and a crown can often save the tooth. There are many different types of cracked teeth. Some can only be seen using X-rays, while others are clearly visible to the naked eye. Some cracks cannot be detected on X-ray or visually and are diagnosed from the clinical symptoms. In cases where the tooth root is affected, root canal therapy is the most viable treatment option. The pulp, nerves and vessels of the tooth will be removed, and the resulting space will be filled with gutta-percha. A crown or filling will be added to stabilize the tooth and it will continue to function as normal. Some teeth will need specialist referral to determine if they can be reasonably restored. As a general rule, it is better to treat identified cracks at an early stage as their tendancy to extend often results in a need for more extensive treatment. If you have any questions or concerns about cracked teeth, please ask us. Ongoing research indicates that antioxidants and other nutrients found in fruits, vegetables, legumes and nuts may strengthen immunity and improve the body’s ability to fight bacteria and inflammation, all of which can help protect the teeth and gums. And some foods and dietary habits even have distinct effects on the mouth’s ability to handle cavity-causing bacteria attacks. Calcium-fortified juices, milk and other dairy products are rich in calcium and vitamin D and help promote healthy teeth and bones, reducing the risk for tooth loss. Adding powdered milk to cooked dishes helps those who don’t like milk or cheese to get some of the calcium needed to protect teeth and jawbones. Recent studies indicate that fresh cranberries interrupt the bonding of oral bacteria before they can form damaging plaque. Folic acid promotes a healthy mouth and supports cell growth throughout the entire body. This member of the B vitamin family is found in green leafy vegetables and brewer’s yeast. You may already know that cavity-causing organisms feed on the sugar in foods such as soda, chocolate milk and candies and convert it to acid, which attacks tooth enamel and causes tooth decay. But did you know that acidic foods and drinks can wear away your enamel, leaving your teeth sensitive, cracked and discolored? A diet that promotes good oral health is not just about the foods you eat or avoid — when and how you eat them is equally important. Foods that take a long time to chew or that you hold in your mouth (such as cough drops) can damage teeth as they retain sugar in the mouth longer than do other foods. Instead of snacking on sugary, carbohydrate-rich or acidic foods throughout the day, eat these foods just during meal times in order to minimize the amount of time teeth are exposed to acid. In addition, the body produces more saliva to help digest larger meals, which washes away more food and helps neutralize harmful acids before they can attack teeth. Information courtesy of the Academy of General Dentistry. This is the third in a series of posts about biofilms and how they relate to you. We have learned that biofilm (plaque) builds up on your teeth, or oral appliances, and the net effect is to cause disease, either decay or gum disease. The most common way of removing biofilm in an oral health context is by regular brushing and flossing. You can equate this to the necessity to regularly clean your kitchen surfaces, shower or bath in order to maintain a healthy environment in which to live. The more regularly this happens, the less opportunity those bacteria have to develop into those teeming cities of goo we described earlier. Although gum disease can be controlled by proper oral hygiene (toothbrushing, flossing, rinsing), gingivitis (the mildest form) is still experienced by most of the population at some point in life; a smaller proportion (30% to 40%) experience periodontitis (the severe form). Treatment of oral infections such as gum disease and decay requires removal of the biofilm and calculus (tartar) from the teeth and gums by surgical or nonsurgical procedures, sometimes followed by antibiotic therapy. This means that the biofilm needs to be regularly removed by your hygienist or dentist if you want to try to prevent the progress of the disease process. Unfortunately, these infections are not completely responsive to antibiotics. For this reason, oral infections are chronic diseases that require ongoing treatment and daily care by proper oral hygiene measures. Prevention is certainly the best strategy. When good oral hygiene practices fail to prevent the development of biofilms, toothpastes and mouthwashes with chemotherapeutic agents can be used. These agents can kill microorganisms in the biofilm. Chlorhexidine, triclosan, and essential oils and minerals–agents proven to kill the harmful bacteria–can reduce the degree of plaque and gingivitis, while not allowing disease-causing microorganisms to colonize. Is Biofilm on Your Oral Appliances? In addition to biofilm being present in the mouth, it also forms on dental prostheses and appliances, such as removable dentures and retainers, mouthguards, and nightguards. Dental prostheses can become colonized with large numbers of microorganisms within 2 hours of use. Biofilm on your oral appliances and prostheses can increase your risk for cavities and gum disease, especially on the teeth used to maintain your dental prosthesis in your mouth. Brush your teeth and all mouth prostheses or appliances to mechanically disrupt the biofilm. Choose a toothpaste containing antibacterial ingredients, such as triclosan. Rinse your mouth with a mouthwash containing antibacterial ingredients, such as chlorhexidine, cetylpiridinium chloride, or mixture of essential oils in alcohol. Soak your prosthesis with a commercially available cleaner. If your denture liner is cracked, porous, or peeling, ask your dentist to repair it. To eliminate unwanted disease causing organisms embedded in porus or cracked areas in your appliance, ask your dentist to replace your prosthesis every 7 years. This is part 2 in a series of posts about Biofilms. Biofilms happily colonize many household surfaces in the bath and kitchen, including toilets, sinks, countertops, and cutting boards. Poor disinfection practices and ineffective cleaning products may increase the incidence of illnesses associated with pathogenic organisms encountered during normal household activity. Basically, they can form on any damp surface which has not been properly cleaned. From an oral health point of view, they form on the tooth surface, both root and crown. Free-swimming bacterial cells land on a surface, arrange themselves in clusters, and attach. The cells begin producing a gooey matrix. The cells signal one another to multiply and form a microcolony. The microcolony promotes the coexistence of diverse bacterial species and metabolic states. Some cells return to their freeliving form and escape, perhaps to form new biofilms. In this way, biofilms can spread over large areas of surface if given enough time. In an oral health setting, it is possible to detect biofilm (plaque) formation just 20 minutes after you have cleaned your teeth. Next time, we will write about the effects of uncontrolled biofilm and how to control it. 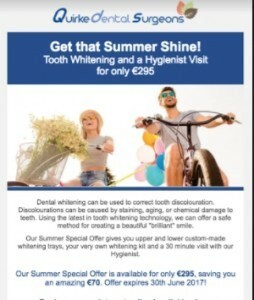 We are running a summer whitening special offer incorporating upper and lower custom whitening trays and a 30 minute hygienist visit, all this for €295. Just give us a call on 051 421453 to arrange an appointment, but do it quickly because this offer closes on 30 June, 2017. Angel Clarissa on Who needs antibiotics before a dental procedure?